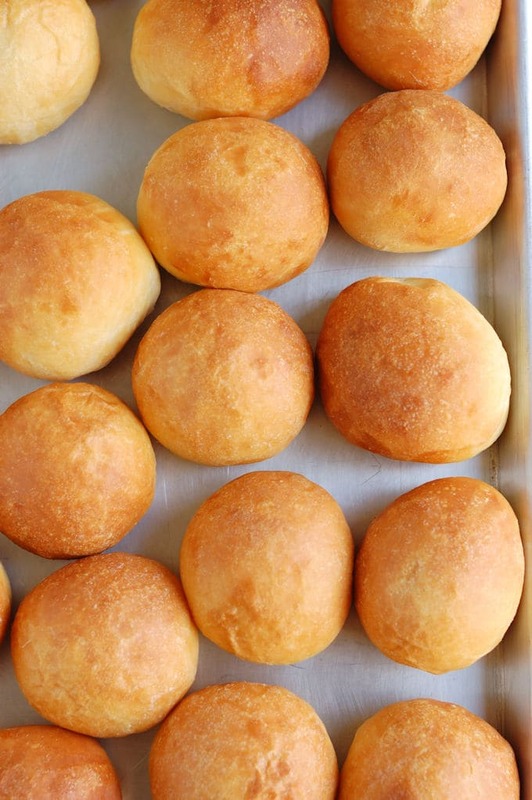 If you want to make the perfect dinner roll, look no further. 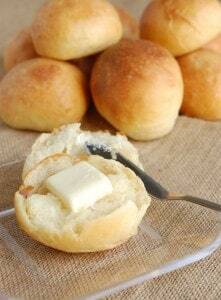 Buttermilk dinner rolls are soft, buttery, light and luscious. This recipe was created all because we’d bought a couple of salmon burgers at the farmer’s market one Saturday. I decided to make my own burger buns because I wanted the perfect, soft bun for the delicate burgers. It was early enough in the day that I had time to put the dough together for dinner that night. Use Buttermilk for the perfect soft roll! The butterfat in the milk interferes with the development of gluten in the dough for a softer texture and the fat also makes a richer dough. Acidic buttermilk softens the gluten in the bread even more for an extra tender crumb and great flavor. One egg contributes a nice flavor and color. I used a portion of the dough to make a couple of salmon-burger buns, and the remaining was turned into a sandwich loaf. I started with the same recipe as the burger buns but wanted an even richer dough. A pinch of sugar added just a whisper of sweetness and a little butter upped the richness and flavor. 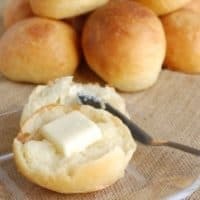 Melted butter brushed onto the rolls before baking keeps the tops soft and a little more brushed on as soon as they come out of the oven is the perfect finishing touch. The recipe makes 16-24 rolls depending on the size you want. 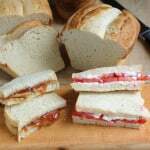 You could also bake the dough in a loaf pan for a tasty sandwich bread. Combine buttermilk, yeast, sugar, salt and egg in a mixing bowl. Mix on low speed to combine the ingredients. Add 2.5 cups of bread flour and mix to combine. Switch to the dough hook if mixing on a stand mixer. Add 1 1/2 - 2 cups of bread flour until the dough gathers on the hook and begins to pull away from the sides of the bowl. Knead on medium for 3 minutes then reduce the speed to low. If mixing by hand stir in as much flour as you can with a wooden spoon, then knead the remaining flour in by hand. With the mixer running, toss in the softened butter a tablespoon at a time. If working by hand, knead in the butter. Mix on medium for 3 minutes, if the dough is still very sticky add a little flour. The dough will stick to the bottom of the bowl but should gather on the hook. Dump the dough onto a floured surface and knead to form a smooth ball. The dough should be soft and smooth. Place the dough in an oiled bowl, turning once to coat the surface, cover with plastic wrap and set in a warm place until doubled in size, about 1 1/2 - 2 hours. Turn the dough out onto a lightly floured surface and roll the dough to form a long log shape. 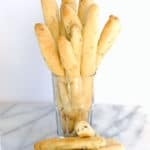 Using a sharp knife or bench scraper cut the dough into 16-24 even pieces (depending how large you want the rolls to be. They'll bake up at least 2x the size of the dough ball). 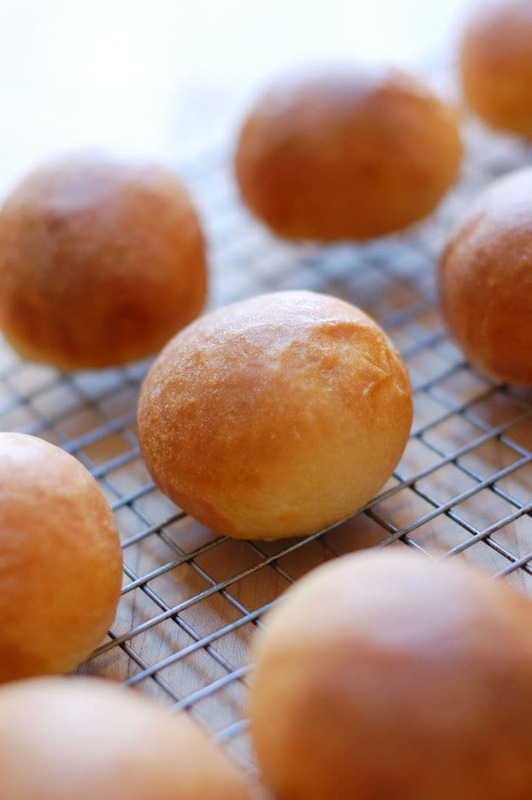 Roll each piece of dough under your cupped hand to form a smooth ball. 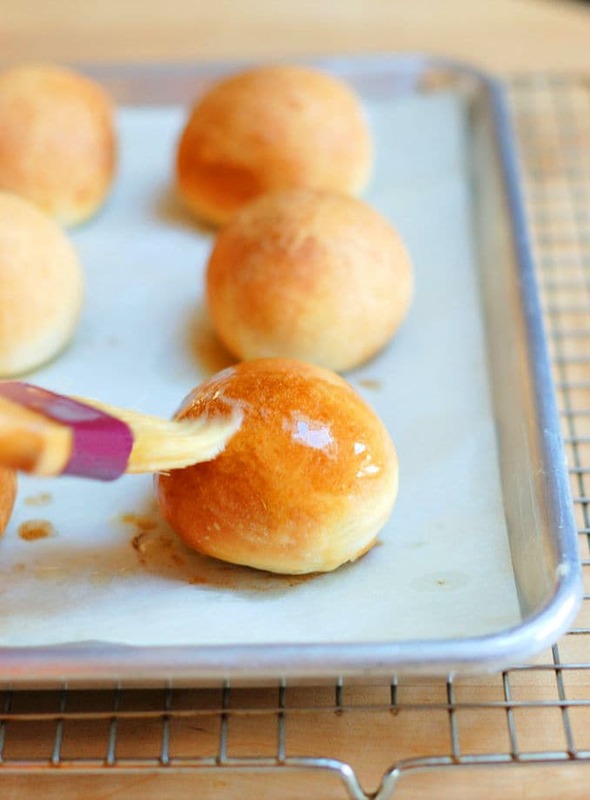 Place the rolls onto a parchment lined baking sheet and brush the tops with melted butter. Set aside in a warm spot to rise until nearly doubled in size and the dough springs back slowly when poked (about 1 hour). Preheat the oven to 375°F. 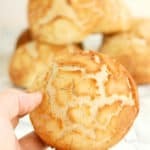 Bake the rolls until they are golden brown and feel light when picked up. About 10-15 minutes. As soon as the roll come out of the oven brush the tops with the melted butter. Enjoy warm or at room temperature. To work ahead the dough balls can be frozen on a sheet pan then packed into freezer bags. Allow the dough balls to defrost and then rise before baking. The baked rolls can also be frozen. 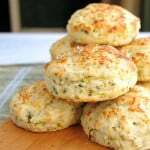 These will make a great addition to holiday dinners. They look so soft and warm! Yum! Rolls like these are perfect for sliders. I’m not a big baker but I will have to try my hand at these. They’re really great for leftover turkey sliders. 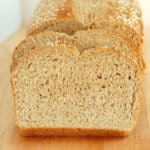 Can I use regular unbleached white flour instead of bread flour? This is a fairly soft dough because of the buttermilk, butter and eggs. 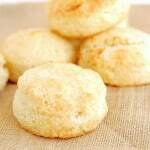 You could try using unbleached all purpose flour instead of bread flour. You may have to add extra flour since all purpose flour doesn’t absorb as much liquid as bread flour. Also, knead the dough a little longer to develop the gluten. After the first rise if it doesn’t feel nice and elastic you can knead it again and give it a second rise before shaping. Let me know how it works out. If I wanted to make and freeze these rolls ahead of time, would you freeze them after rolling them into the individual rolls? Also, what would be your suggestions for defrosting them before cooking? Yes, you could freeze them as soon as you roll them. Freeze them on a sheet pan so they don’t stick together then put them in a freezer bag once they’re frozen. Take them out of the freezer several hours before you plan to bake them. Line them up on a tray covered with plastic wrap. Let them finish defrosting and rising at room temperature. The exact timing will depend on the temperature of your kitchen, but I would allow at least 3 hours for them to defrost and rise. You could also bake them, allow them to cool, bag them in freezer bags. Defrost, then warm in the oven before serving. If I wanted to make the dough & then bake the next day at which point do I refrigerate? I am thinking after the dough rises & before forming into rolls. Thanks, looks like a keeper! I would refrigerate the dough before forming the rolls. Take the dough out the next morning and then let it come to room temperature before forming the buns. Alternately, you could make and bake then rolls, freeze them, then rewarm then in the oven the day you are going to serve them. thank you for sharing this recipe, they look so yummy. I can’t wait to bake them.